For months now, I’ve been wrestling with how to deal with “Link Party Highlights”. Naturally, I want to be able to highlight some of the awesome projects that are linked up week after week after week. I’ve tried a couple of different things. Second, I tried doing a separate “Link Party Highlights” on Monday mornings showcasing some of the projects. Again, that’s fine, but the same problem arises. Once that post is “off the radar”, people will likely not see that project anymore. So, I think I have the solution. For the foreseeable future, Fridays will be all about you! I will use Friday mornings to feature projects from the previous week’s link party. Each project will have its very own post, and each project will go under the “Inspiration Files” category. That way it gets showcased in the main Inspiration Files gallery (as well as the appropriate Inspiration Files category page), and the projects are easily accessible by one simple click from any page on the blog via the main menu at the top. My hope is that if your project is featured, not only will you get traffic from the initial feature, but you’ll have a much better chance at getting a trickle of lasting traffic since the project will be in a more prominent place on my blog. Sound good? I sure hope so! If you missed last week’s party, you can click here to see everything that was linked up. Wow – I’m #1! Can’t wait to see all the great ideas! My very good bloggy friend Kelly is too funny! So glad her gorgeous kitchen remodel snagged that #1 slot! You are so thoughtful Kristi! I appreciate you hosting each week! Kristi the inspiration file sounds like a great plan! Always fun getting to join in on the fun when I can which doesn’t seem to often as I am so slow in getting projects done! Hi! 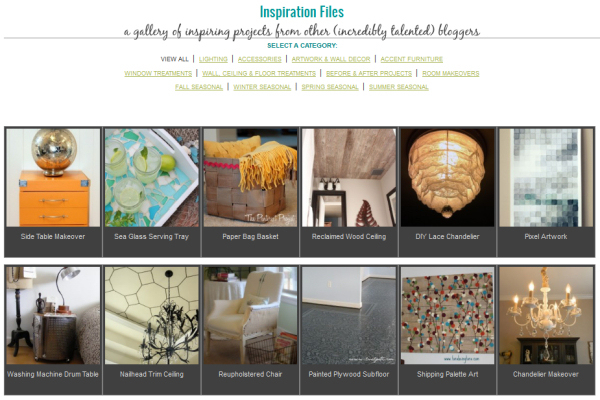 I am pretty new to your blog, but I think the Inspiration Files Idea is totally Fab! I have been wanting to link up for a while, and today I finally had a project that I think is totally worthy of a link up! We just finished Chevron Stripes in the wall in our entry and they are A-MA-ZING! Thanks again for doing this and for trying to help people with new blogs get their names out there! Thank you so much for hosting and for putting so much thought into your readers!